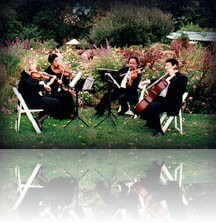 ormerly known as the Celebrated String Quartet, String4 is an experienced and established ensemble. We have been consistently selected as Washington’s Top Ensemble by the Washingtonian Magazine and by The Knot Best of Weddings Magazine. Quality, exceptional musicianship, professionalism, and personalized service has made this string quartet the finest in our nation’s capital. Our immense repertoire features hours of classical favorites, popular tunes, jazz standards, tangos, waltzes, salsa, rock & roll and much more! String4 is a traditional string quartet composed of two violins, viola, and cello. Since 1989, the group has performed for the most prestigious events in Washington, including state dinners, the presidential inauguration, embassy functions, national service award ceremonies, academic award presentations, charity functions, and over a thousand weddings. We arenot an agency which means you work directly with us, the same musicians that will perform at your event. We manage scheduling the date, music selection for your event and coordinating music on the day of your event. String4 will manage it all. We are full-time musicians — our “day job” as professional musicians ensures that you will receive 100% of our attention in creating the perfect event. The String Quartet is owned and managed by full-time musicians. As full-time professionals, we are available during the day to assist you in every aspect of your plans including music selection and timeline management. This personalized client relationship is unique, and insures the highest quality customer satisfaction. Best of all, there is no agency or management commission in our fee. String Quartet or String Trio? 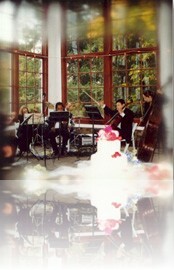 String4 specializes in string quartet performances. Our objective is to present excellence each time we perform. Years of experience demonstrate that this combination offers the most musical enjoyment for the ensemble and the audience. String quartets, unlike other smaller combinations and mixed ensembles, have the largest repertoire to select from, and produce a rich and full sound, supporting the melody and harmony.